Did you really think that the 2016 TX Primary was over? Well, it’s not! Southeast Texas conservatives have a unique opportunity to elect not one, but TWO liberty-minded state representatives in this runoff election…. don’t you want to be a part of that action?!? Briscoe Cain is winning hearts & minds in TX House District 128 (map) while working really hard to defeat a 14 year incumbent, who happens to be the Chairman of theLicensing and Regulations Committee in our TX House. Briscoe actually won the Primary with 48% with three in race, with the third opponent, Melody McDaniel endorsing him! Keith Strahan ran in an open seat with six other candidates to replace the tyrannical Straus lieutenant, John Otto. Keith came out on top in the runoff, with over 28%, against the establishment’s pick. TX House District 18 (map) is a rural district in which Keith is a pillar within it’s communities and CAN win this race! 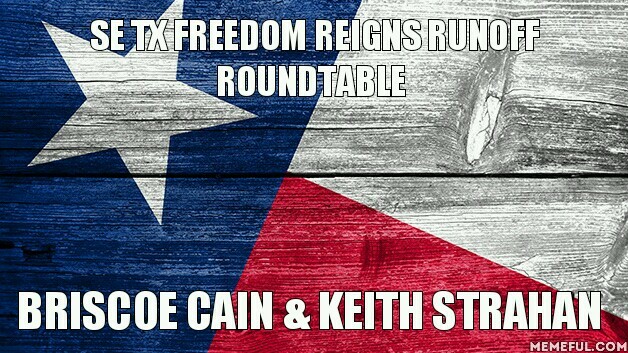 Keith Strahan and Briscoe Cain would be a fantastic addition to our TX House ‘Liberty Caucus’, led by Jonathan Stickland, Matt Rinaldi, and Tony Tinderholt …….. and would pave the way for others in our part of Texas. Are you ready to make some history? GOOD! Join us and don’t forget your checkbook! Please RSVP to this ‘MUST NOT MISS’ event! PS Iguana Joe’s has provided a specially priced meal menu for all attendees. Please take advantage of this offer and patronize them for accommodating this great event!